Now, live from space, it’s Earth all the time! A new experiment called the High Definition Earth Viewing (HDEV) was launched on April 18, 2014 in the “trunk” on the SpaceX Dragon spacecraft and has been set up outside the International Space Station. The set of four commercial HD video cameras and is now operational, after being installed on the External Payload Facility of the ESA Columbus module yesterday. The cameras and electronics are enclosed in a pressurized box to provide protection to the equipment from the harsh environment of space. Above is the UStream video, or you can bookmark the UStream site here, or view this page from Johnson Space Center which also provides a visual tracker of where the ISS is located over Earth. Please note that the screen will appear black when the ISS is in orbital night — which happens every 90 minutes and lasts about 40 minutes. There also has been some downtime off and on that I’ve noted while watching this morning. This may be due to some initial setup/operation issues, or some occurrences of loss of signal. UPDATE: NASA’s now provided additional info on what’s happening if you’re not seeing beautiful views of Earth at anytime during the live feed: Black Scenes = Night side of the Earth; Gray Scenes = Switching to the next camera, or the communications downlink from the ISS in not available at the moment. Also, the live video feed from HDEV will occasionally be unavailable due to loss of Ku-band transmission from the International Space Station. If that happens, just check the site again later. But, having live HD streaming views of Earth is pretty awesome – but it’s also nifty to note that this is part of a student project. High school students helped design of some of the HDEV components through the High Schools United with NASA to Create Hardware (HUNCH) program. Student teams will also help operate the experiment. This experiment is completely separate from the UrtheCast commercial cameras on the ISS. 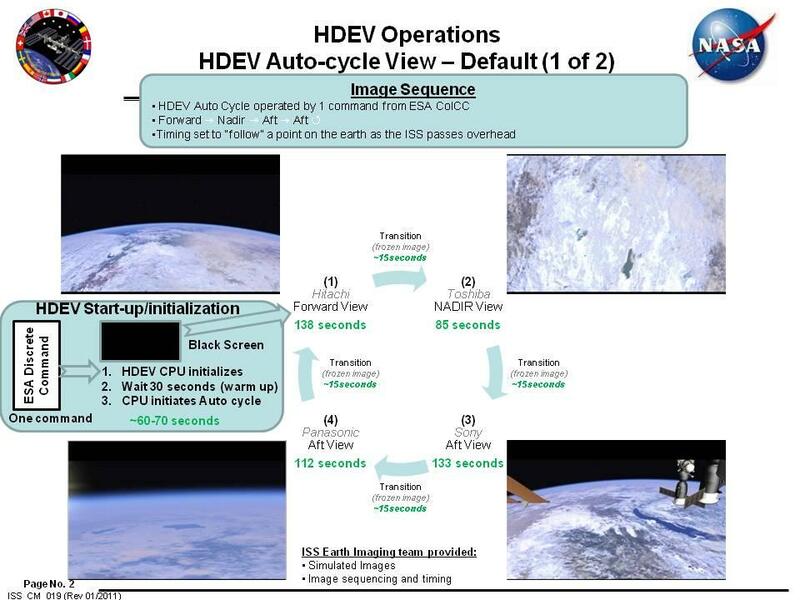 The HDEV does not record video on board the ISS, but all video is transmitted to the ground in real time. See the graphic below that explains how the cameras cycle automatically. Part of the experiment is to test out the camera and equipment and assess the hardware’s ability to survive and function for long periods in space.